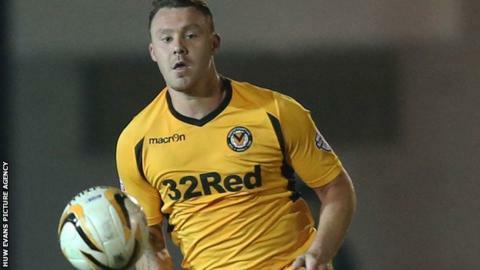 Wales international Darcy Blake is set for a return to Newport County in the New Year after spending six months without a club. Blake, 26, failed to find a club in the summer after leaving Newport at the end of the 2013-14 season. Manager Justin Edinburgh confirmed the defender has been training at Rodney Parade with a view to re-joining. "It would be an absolute waste if the boy didn't get back into the pro game," said Edinburgh. Newport are looking to replace Andrew Hughes who is out for up to 12 months after suffering a serious knee injury in the victory over Stevenage. Former Cardiff City player Blake made eight appearances in his last spell at Newport, but could not agree a contract with Edinburgh to keep him at Rodney Parade. "Obviously nothing can be done until 3 January, but considering [how little] he's played he's in decent condition." In the meantime Blake has been playing local league football in Gwent, after also failing to secure a contract at Plymouth Argyle. Former Tottenham defender Edinburgh has been impressed with Blake's attitude in training and is hopeful a deal can be agreed. "Obviously nothing can be done until 3 January, but considering [how little] he's played he's in decent condition," added Edinburgh. "And if you can find an ideal replacement [for Hughes] then we certainly have one waiting in the wings with Darcy Blake. "Only a couple of years ago he was playing in the Championship with Cardiff City, so I think it's a no brainer for us [and] hopefully we can get it to come off and we can get him playing again." Edinburgh said the club's failure to come to an agreement with Blake and the end of his last spell at the club would have no bearing on a new deal. "At that time we were not in a position to offer Darcy anything," said Edinburgh. "But in football your circumstances change - and our circumstances and his circumstances are totally different now so it makes sense."